This case analysis is based on hekate process. The ARD process can be easily explained using the following example. It is a reworked Thermostat case. The main problem described here is to create a temperature control system for an office. The design process is shown below. The seasons ARE correct, the Author lives in Australia. We model the system aiming at matching the original rules. First, it is stated that there is a system to be designed which is described by a single conceptual attribute Thermostat. It is so called level 0 of the design. Refining knowledge about what is the purpose of the system makes a transition to the diagram at level 1; it is a finalization. It is stated that the thermostat controls temperature and this control has something to do with time. That is why Thermostat is finalized into Time and Temperature. 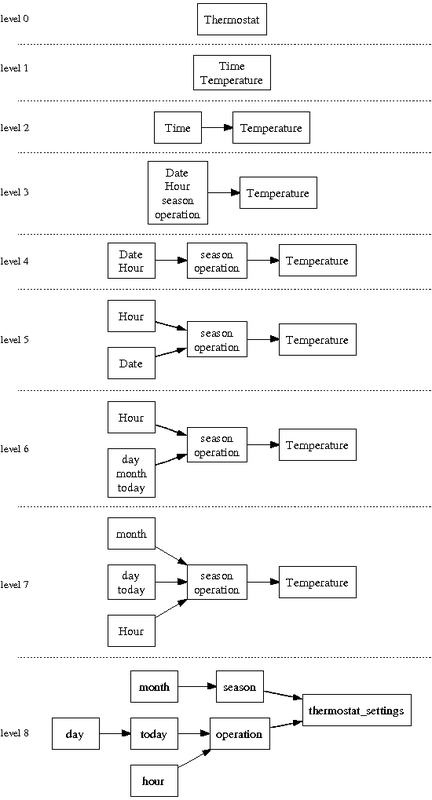 Furthermore, at level 2, it is stated that Temperature depends on Time: there are two properties identified in the system and a functional dependency between them. The design process continues, through splits and/or finalizations, until all physical attributes (indicated with lower case letters) are identified and relationships among them are stated which is presented at level 8. VARDA can automatically optimize the diagram, by re/collapsing the lowest ARD using TPH. the xtt design is consistent with the book w.r.t seasons and temperature!